Although aided by visual inspection, the final recognition and quality evaluation of food relies on chemoreceptive events in our nose and oral space, mediated by volatile odor-active and non-volatile taste-active molecules. These are interacting with ~390 odorant receptor proteins located in the regio olfactoria in the human nose and ~40 taste receptor proteins, including the heterodimeric T1R1/T1R3 (umami) and T1R2/T1R3 (sweet) taste receptor and a family of 25 TAS2R bitter-taste receptors expressed on the tongue. 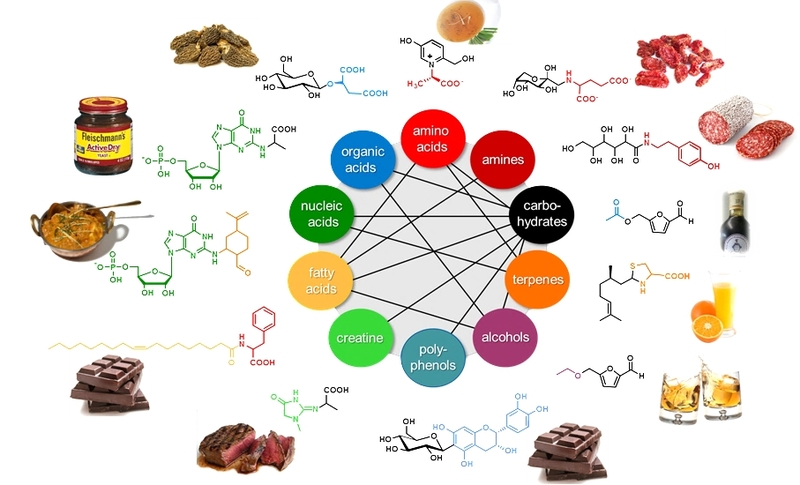 It is well-accepted today that not a single flavor impact molecule, but a combinatorial code of multiple odor- and taste-active key compounds, each in its specific concentration, is reflecting the chemosensory phenotype and is triggering the typical flavor profile of food products. The research at the Hofmann’s lab encompasses a unique methodology, coined SENSOMICS, by combining state-of-the-art natural product analytics, human psychophysical techniques, and bioinformatics tools with unequaled expertise, which allows for a sustained scientific competitive advantage. Separation of a volatile fraction containing the odorants from the non-volatile fraction of food constituents containing the taste-active components by means of SAFE distillation. Localisation of intense odorants/tastants by means of bioresponse-based discovery techniques such as gas chromatography-olfactometry (GC-O) and aroma extract dilution analysis (AEDA) for odorants, and 1D/2D-HPLC combined with the taste dilution analysis (TDA) for non-volatile taste compounds. Unequivocal identification of key odorants/tastants by means of GC-MS, LC-TOF-MS, LC-MS/MS, and 1D-/2D-NMR experiments, followed by independent chemical synthesis. Quantitation of individual odorants/tastants in the target food item by using HRGC-MS/MS (odorants) and UPLC-MS/MSMRM (tastants) and stable isotope dilution analyses (SIDA) with 13C- and/or 2H-labelled twin molecules of the respective key odorants/tastants used as internal standards, and/or the ECHO technique using purified non-labelled reference compounds as pseudo-internal standards to compensate for the effect of co-extracted matrix components in mass spectrometric analysis. Calculation of dose-over-threshold (DoT) factors (also referred to as odour activity value or taste activity value, respectively) defined as the ratio of the concentration of a stimulus in a food item over its human sensory recognition threshold concentration. Validation of analytical and sensory data by means of chemosensory re-engineering experiments (“proof-of-concept”): a total recombinant of all identified odorants and tastants, each in its “natural” concentration as found in the target food item, is sensorially compared to the flavour profile of the authentic food item to confirm that all key odorants and tastants have been successfully identified and quantitated. Human psychophysical experiments including dose-response and time-intensity recordings to determine inter-individual differences in sensory perception. 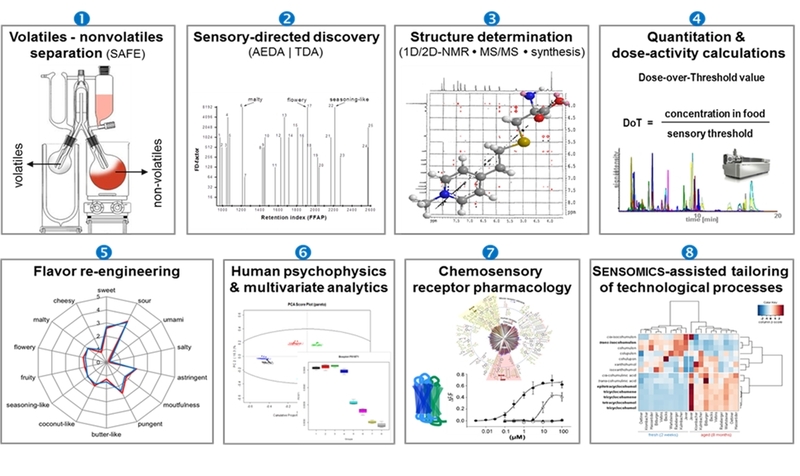 Chemosensory receptor pharmacology to identify ligand - chemosensory receptor pairs and understand the mechanisms of their biological action by combining functional data from psychophysical experiments and chemosensory receptor de-orphanization studies. 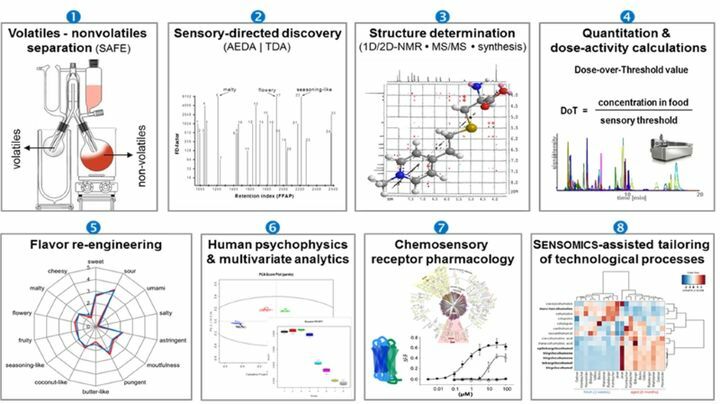 Mass spectrometric monitoring of the comprehensive chemical code of chemosensates to visualize the impact of raw materials (genotypes, varieties etc. ), processing parameters, and storage conditions, thus helping to navigate food manufacturing towards hedonically improved products (“SENSOMICS-assisted food engineering”). Application of the SENSOMICS concept (Fig. 1) revealed that many previously unknown chemosensates, like those displayed in Fig. 2, are formed throughout food processing from sensorially inactive precursor molecules. For example, for the first time has the generation of taste enhancers been found upon thermal processing of beef meat: the inner salt of (+)-(S)-N-(1-carboxyethyl) 6-hydroxymethyl-pyridinium-3-ol, formed by Maillard-type reactions from hexoses and the amino acid L-alanine, was found to significantly enhance human sensitivity for sweet and umami molecules. In comparison, the Maillard reaction with creatine/creatinine and reducing carbohydrates leads to the formation of N-(1-methyl-4-oxo-imidazolidin-2-ylidene)-α-amino acids, which enhance the authentic meat character and long-lasting mouthfullness of cooked beef. However, the same reaction with the 5‘-ribonucleotide GMP gives rise to the umami enhancing N(2)-(1-carboxyethyl) guanosine-5′-monophosphate in yeast extracts. Another example is the identification of the allosteric hTAS1R2/hTAS1R3 sweet taste receptor modulator 5-acetoxymethyl-2-furaldehyde in traditional Balsamic vinegar. The knowledge of such chemosensory key molecules then opens new avenues towards a better understanding of their sensory activity by correlating functional data from human psychophysics studies and taste receptor activation patterns. For example, the organoleptic properties of steviol glycosides, the sweet principles of Stevia Rebaudiana Bertoni could be defined on a molecular level for the first time and the degree of glycosylation as well as the double bond at position C16 were found as crucial structural elements for the selective activation of the bitter receptors hTAS2R4 and hTAS2R14 as well as the hTAS1R2/R3 sweet taste receptor (Fig. 3, A). After development of a stable isotope dilution analysis (Fig. 3, B), all steviol glycosides were quantitated by means of HILIC-MS/MSMRM. Also, new down-stream processing procedures were deduced to enable the targeted manufacturing of sensorially preferred Stevia extracts. This research was awarded the Journal of Agricultural and Food Chemistry Research Paper of the Year Award 2013. Fig. 3. (A) Structure relationship and taste receptor activation and (B) quantitation of steviol glycosides by means of HPLC-MS/MS-MRM and stable isotope dilution analysis (SIDA). Moreover, the population of chemosensory active molecules (“sensometabolome”) is used as a molecular blueprint for visualizing the changes in sensometabolite profiles throughout breeding programs, post-harvest manufacturing processes, and/or storage of food. Modern bioinformatics tools help to deconvolute the complex interactions between the individual chemosensates and help to navigate process parameters towards the targeted development of healthy and taste food products. For example, the hop-derived bitter compounds in hop extracts and beer were comprehensively captured for the first time by means of HPLC-MS/MSMRM in the various process intermediates throughout beer manufacturing from hops and malt to the bottled and matured beer (Fig. 4), and their respective bitter taste receptors hTAS2R1, hTAS2R14, hTAS2R40 were conclusively identified. Singldinger, B.; Dunkel, A.; Hofmann, T. (2017) The cyclic diarylheptanoid asadanin as the main contributor to the bitter off-taste in hazelnuts (Corylus avellana L.). J. Agric. Food Chem., 65, 1677-1683. Dunkel, A.; Meyer, S.; Hofmann, T. (2016) Sensomics-assisted elucidation of the tastant code of cooked crustaceans and taste reconstruction experiments. J. Agric. Food Chem., 64, 1164-75. Dunkel, A.; Steinhaus, M.; Kotthoff, M.; Nowak, B.; Krautwurst, D.; Schieberle, P.; Hofmann, T. (2014) Nature’s chemical signatures in human olfaction: a foodborne perspective for future biotechnology. Angew. Chem. Int. Ed., 53, 7124-7143. Hillmann, H.; Mattes, J.; Brockhoff, B.; Dunkel, A.; Meyerhof, W.; Hofmann, T. (2012) Sensomics analysis of taste compounds in balsamic vinegar and discovery of 5-acetoxymethyl-2-furaldehyde as a novel sweet taste modulator. J. Agric. Food Chem., 60, 9974–9990. Hellfritsch, C.; Brockhoff, A.; Staehler , F.; Meyerhof, W.; Hofmann, T. (2012) Human psychometric and taste receptor responses to steviol glycosides. J. Agric. Food Chem., 60, 6782-6793. Congratulation to Dr. Singldinger and Dr. Bader!